Sound appealed to him, the birds singing, the babbling stream, the sound of the mowing machine, the squeal of the bonham, the wheels on the track of the West Clare Railway and anything that created rhythm. These sounds were music to his ears and as a result he composed jigs, reels, hornpipes and slow air. He also had a unique ability to convert slow airs into dance tunes. 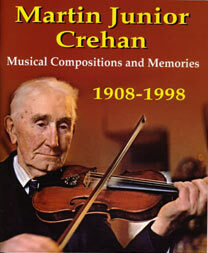 For example, he used the air ‘Caoineadh an tSagairt' to compose the hornpipe 'Caisleán an Óir'. The lyrics for his songs were of a personal nature to him. There is a great draíocht and tradition in Martin 'Junior's' music and it reflects his calm and relaxed personality and his peaceful attitude to life. Publishing his works ensures their transmission to future generations. 'Music and composition are God-given gifts and should be respected'. A4 book with card covers.